They say art speaks to the soul, and I agree. Whether it’s a painting or digital art, every piece shares its own story; inspires its own emotions. And whether you’re a child, an adult, or someone in between, images speak to you differently than anyone else – that’s what makes unique art such a wonderfully warm conversation starter. The art for kids (and adults) you’ll see here is a genuine labor of love: every piece gets a personality of its own with a colorful, vibrant style you’ll feel proud to display in your home. Which speaks best to you, and why? I’d love it if you’d share your thoughts. Simple, modern elegance compliments any décor. Beautiful stories, told with paint – art they will remember and treasure, even as adults. 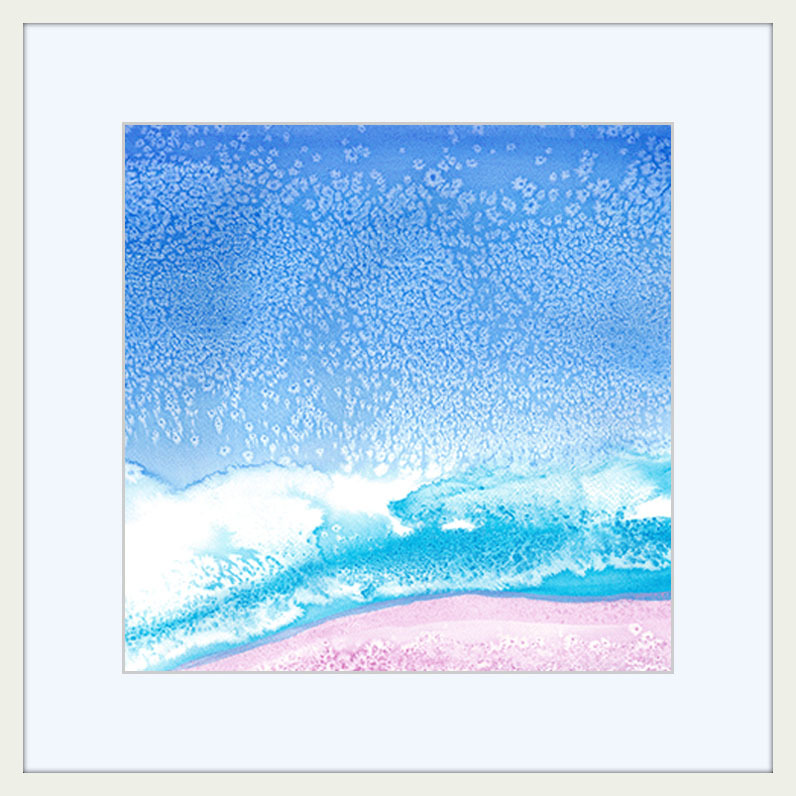 Multi-medium paintings and prints custom-created to match your style and brighten your home. 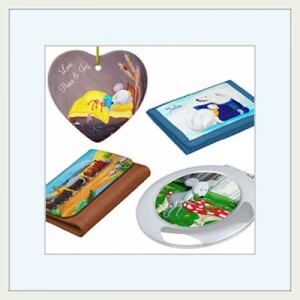 Gifts with distinction – show your friends, family, and coworkers you put real thought into this gift. Express your creative soul! Anyone can do this. You’ll be amazed how well you can bring your ideas to life with the techniques I use in my work and the painting know-how I’ll share with you through my new online course. You can start enjoying the process of creating beautiful paintings right away – and, if you put your mind to it, you’ll reach the stars! 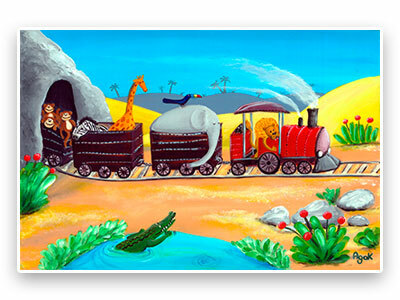 Playful monkeys, shy zebra, jolly giraffe, clever elephant, curious toucan and proud, regal lion tour the world by train… Watch out for cranky crocodiles! 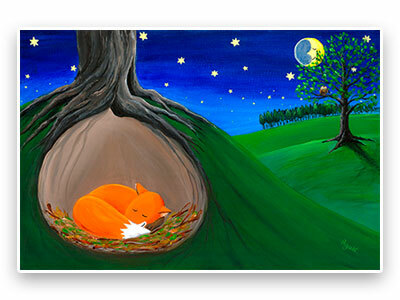 Sleepy little fox waits for sunrise in his safe, cozy den – but the bright owl’s wide awake. Do you think she’ll come calling for another adventure? 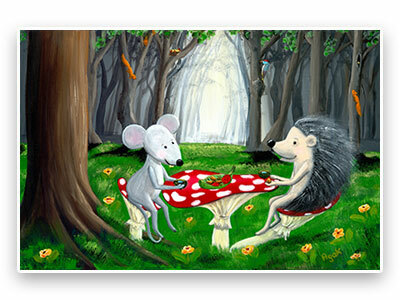 Mouse and Hedgehog are so excited. Enjoying tea with friends is always a good time! Who else is coming to the party, just now appearing between the trees? 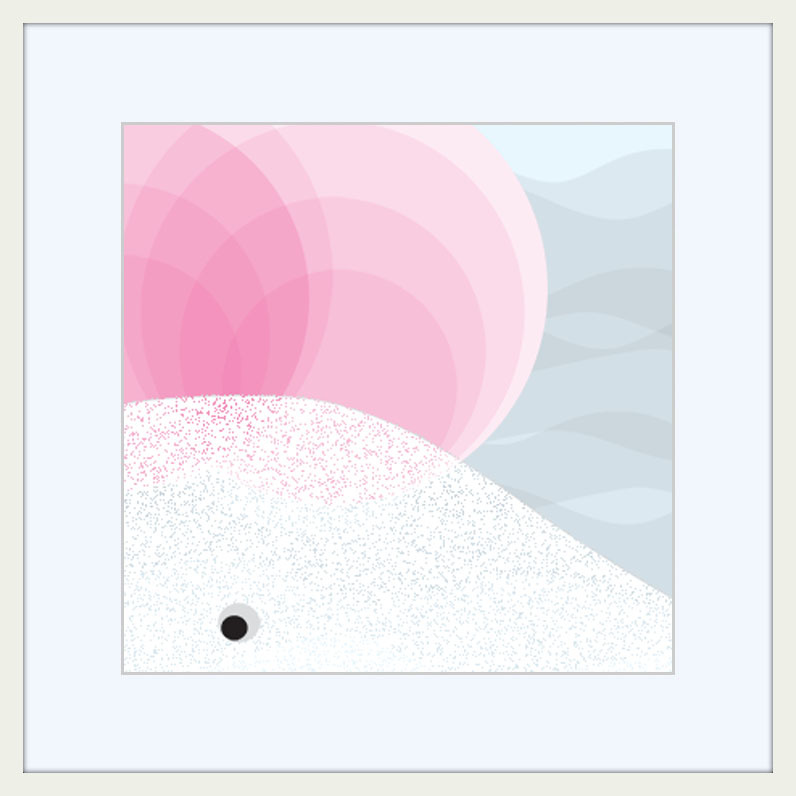 Unique art makes the perfect gift for anyone of any age. It’s a treasure they and theirs will cherish for years to come, thinking of you every time they experience it. 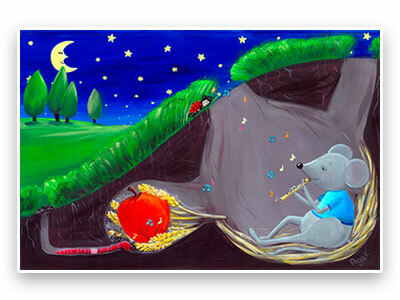 In my store you will find not only children´s canvas art and posters (wall art for kids room, and for your home in general), but also a collection of beautiful, one of a kind designs. The pictures [Snowy Trek, Underwater Firends] are cool because bears have clothes and on my Mermaid picture there’s a really cool eel hiding! This picture [Sweet Dreams] is so cool! The sleepy mousie has a teddy! Looks brilliant [Birdy Tree]. I like it! Reminds me of my childhood… I’m sure children will enjoy stuff like this! My kids love these paintings [Snowy Trek, Sweet Dreams, and Underwater Friends]. They are very colorful and have a positive message. Characters are so cute you want to hug them. Each painting hides some little creatures you won’t notice at first glance. Kids love discovering them! I think these paintings are timeless: unlike popular characters from kids’ TV series, these will never go out of style. I like the atmosphere [Midnight Walk]. I can almost feel the fresh night breeze, and I love the idea that there is so much going on elsewhere while we sleep. 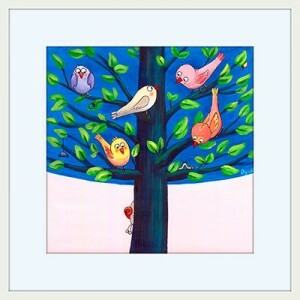 Really beautiful picture [Birdy Tree] on high quality paper, looks beautiful in the nursery! Amazing! 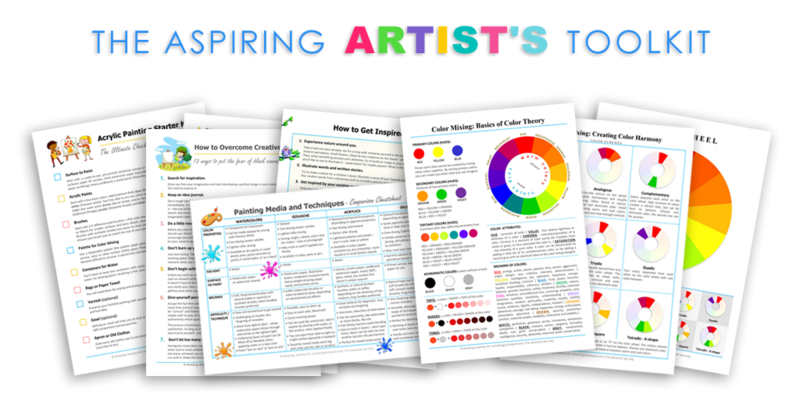 Love your arts, so colorful and vibrant! 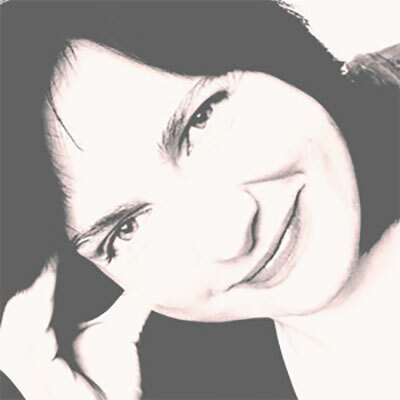 My name’s Aga, and I’m a free spirit who treasures beauty in all forms. That’s what drew me to a career as a self-taught artist (it’s also why I’m a random guitar player, rock collector, and journey-into-the-unknown enthusiast, among other fun things). I grew up in a lovely little village when children weren´t shut in, eyes glued to computer screens. Remember those days? Back then I’d spend every day, from sunrise to starlight, enjoying the world around me: playing with friends in the fresh air as we experienced, in every sense, the seasons changing around us. Discovering the world. “Who needs TVs or fancy toys? There’s no time for that” we thought – imagination was everything to us.